The Damsel in this Dress Blog! 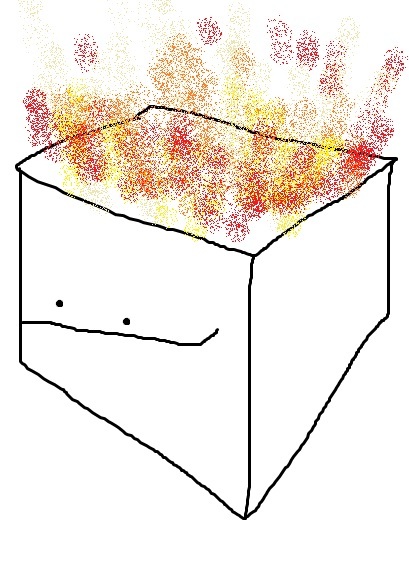 : Suggestion Box! So, without further ado...adieau.....adough.....adoooh? Here are some changes I've been able to make with your help. THANK YOU, for making the product better for everyone, including me!!! First Change: Whether or not to button? -If you know me at all, you know that I love freaking lapel collars. I like how they frame faces, I like how the lines help to create another stacked "hourglass" silhouette on top of the other one you've already created with a corset....I just love it. With our first rendition of them, I wanted them to stay exactly in place, so I buttoned the dang things down. I thought it looked dashing! However, one of our customers came into our booth and pointed out that if the lapel had been pulled a little more over to the side, and then buttoned, it would have fit her chest a lot better. Huh....chests are all shaped differently. Oh, YEAH! But putting in the permanent "jeans style" metal post button, it doesn't allow it to be adjusted for chests. The customer told me that I could just put a button hole on the lapel, and then put a couple of buttons on the corset for different ways to pull the corset. However, right off the bat, it's good to understand a few things: 1. )Every seamstress ever HATES button holes with the fiery passion of a thousand hot pockets. 2. )I don't have a machine that does button holes. You would literally have to get an industrial machine like the ones that do buttons holes in jeans, and it's actually a machine where that's ALL it does. Crazy, right? Did you know that there is a special machine where ALL it does is sewn the inseam of your jeans? Seriously. It's really crazy looking. It looks like a really skinny ironing board with a sewing machine at the end of it, and you sew with a double needle up the inseam of jeans. Anyhow, if I were to decide to spend about $2000 on that specialized of a machine, I would need to raise prices to cover the costs, and seriously make that machine work hard for its money. See how suggestions can be helpful, but can't always be taken to the MAXX? Thus, the collar is no longer buttoned down. It is good to mention with this style that it's best to unlace the straps in the back, lace yourself up completely in the front, and then adjust the lacings in the back to how you would like it to fit, along with folding the collar right where you want it and also maybe even putting in some cool brooches to hold those lapels right where you want them! Woot! -Lowering the boning slightly, because on a larger chest like hers, there ended up being a gap between the bottom front of the empire corset and the top of the underbust corset....right there at the rib cage. By lowering it only about 1/2", it solved the problem, BUT still allowed me to have a happy medium between the old and the new. -More curve "outward" for larger cup size. It is good to note, she is very blessed up top, so when I made hers, I REALLY curved it. However, for the standard pattern, I only gave it about an inch more of an outward curve, and only did it on bust sizes 40 and up. (remember, we're going by your actual measurement around the fullness of your breasts...not your bra size!) It did allow the breasts to "sit" more in the cups, like a bra, rather than being pushed so far up that you would cause traffic accidents. This one is so simple that I don't know why I didn't see it! So, these straps are removable, but on the initial corsets, I had been riveting the heavier brass snap-hook to the actual corset.....thus, if you were going to wear it without the straps, you would have this heavy hook sort of hanging there. 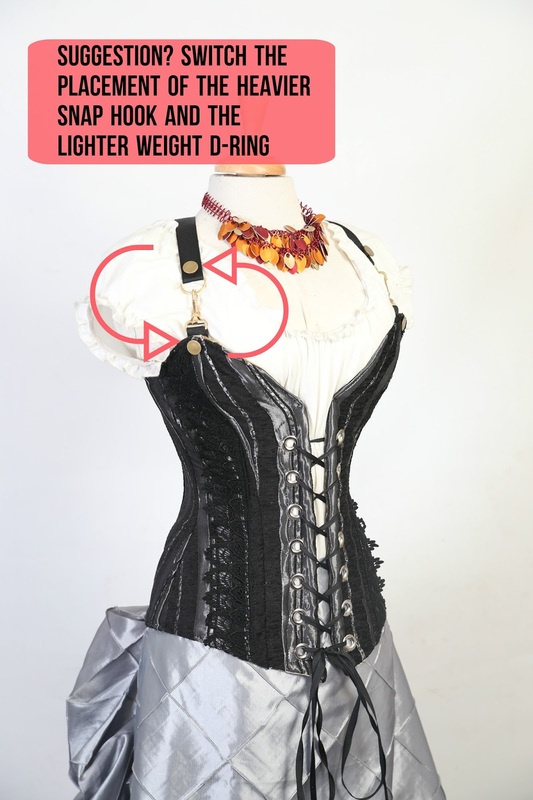 I had several ladies WISELY suggest that I should switch it so the much lighter D-ring would be riveted to the actual corset. The D-ring is light weight enough that you could even fold it down, and hardly even see it there. Duh! Thanks, ladies!! All the ones from here on out will be just as you suggested! I hope this has been illuminating to see that there is a company that truly does listen and even follow your advice! I can't do everything for everyone, and sometimes I get truly odd suggestions from people who have very specific needs, and it would just be unwise to change the whole process to fit one single person and ruin it for everyone else. In those cases, occasionally we can do a custom order, but that's not even always possible. I can't tell you how difficult it can be to communicate clearly what is needed on extremely specific requests. It can take hours of emailing back and forth, pictures, diagrams, and pleas, and it might still not work in real life like it does in our imaginations! That is something I've found to be true over and over again. I have had a clear vision in my brain, but then in real life, it was an absolute flop...which is why I need you guys!